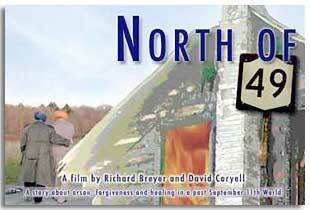 North of 49 tells a story that could have happened in any community in America in the wake of 9/11. Four teenagers destroyed the sacred place of neighbors who wear beards and turbans, neighbors who practice an unfamiliar religion rooted in an unfamiliar culture. Instead of hatred, the act released a force of love and forgiveness. Immediately after the teens were arrested , the Sikhs forgave them – while acknowledging they had to be punished for their crime. Both the arsonists and the Sikhs were victims. The Sikhs suffered a tragic loss. The arsonists suffered the consequences of acting blindly and ignorantly. Two were sentenced to 4 – 12 years in prison, two (who were directly involved in the fire) served 90 days in county jail. This began the slow process of rebuilding the community based on love, forgiveness and respect for all beliefs and world views. The films chronicles this process. Richard Breyer, coproducer is a Professor at the Newhouse School of Public Communications at Syracuse University. He has produced a number of documentaries including: Kasthuri – about an Indian movie star; Esta Esperanza – post civil war in El Salvador and A Toast to Sweet Old Age – longevity in the Republic of Georgia. Professor David Coryell, coproducer is a screenwriter and adjunct professor at the Newhouse School, Department of Television, Radio and Film. His works include Random Acts of Divinity, optioned by MGM and Square Grouper, a thriller set on the Outer Banks of North Carolina is under option with Mockingbird Pictures.